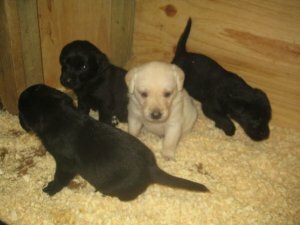 Beautiful home bred Labrador puppies. The puppies were born on 12th July 2012 and have been reared at home with their Mum and Dad who are also owned by us.They will be ready to go when they are 8 weeks old. Both Mum and Dad are pedigree dogs registered with the Kennel Club and have terrific pedigrees. There are numerous Field Trial Champions in their papers. We have certificates for hips , eyes, elbow and Optigen genetic testing. The puppies remaining are yellow and blacks. we secure a puppy and several have already been reserved.You are welcome to come and see us and to see the parents and our puppies. We have started worming them and will do so every two weeks.